Mark your calendar… the grand opening of Egans Creek Playground will take place on Friday, May 18, 7:30 AM. 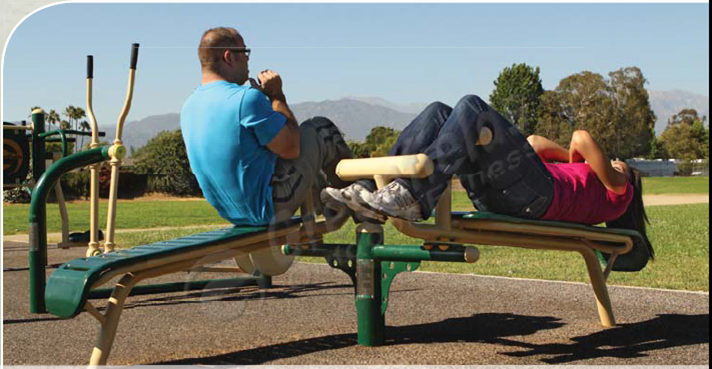 This exciting addition to Egans Creek Park is a place for older children of all abilities to hang out and get some exercise. We can’t wait to see how it looks when it’s completed! What’s Next for Egans Creek Park? 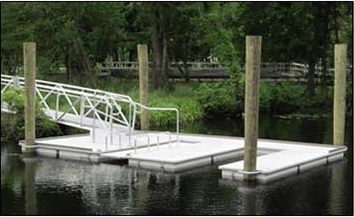 Now that Egans Creek Park has been open for eight months, what can we expect next? Egans Creek Park Expansion – Phase 2! Stay tuned for the big announcement of what you’ll see at the Park in the future! Help Us Get Ready For the Grand Opening! There is plenty to do and with everyone’s help, we can open the park ASAP. Click on the link below and look through the spots, See where you can lend a hand. Drinks and snacks provided! 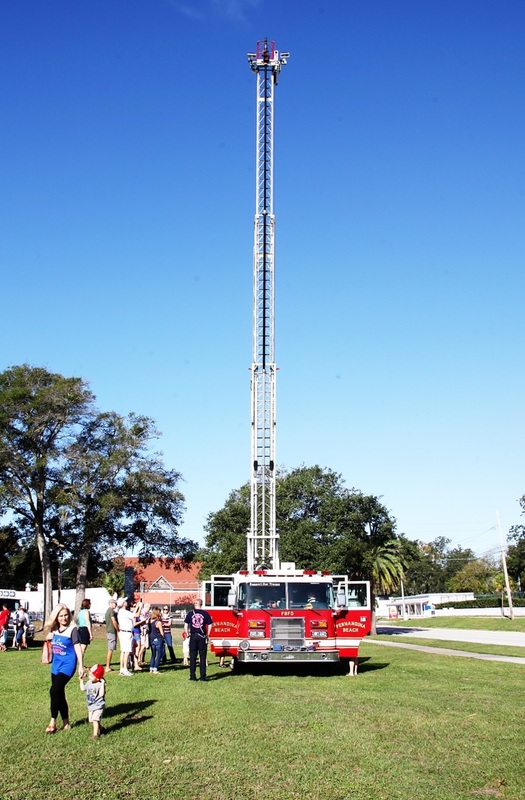 Saturday, October 15 was a great day to say good riddance to Hurricane Matthew and get a close-up look at some great big trucks! Many of the trucks were the same kind that were in operation during the hurricane and clean up. We’d like to thank all the truck people and all the kids, moms, dads, grandparents, families and friends that came to Central Park for this 2017 Touch-a-Truck event! The day was capped off with a REALLY windy landing of the Trauma One helicopter. Calling all artists! 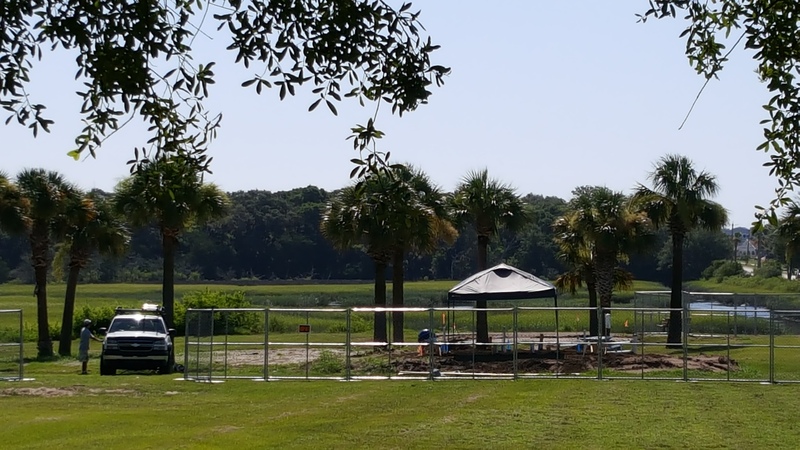 As part of our redevelopment of Egans Creek Park, an outdoor yoga and meditation garden designed by James Loper with Reflections of Nature is being created. This area will include two sculptural focal points. 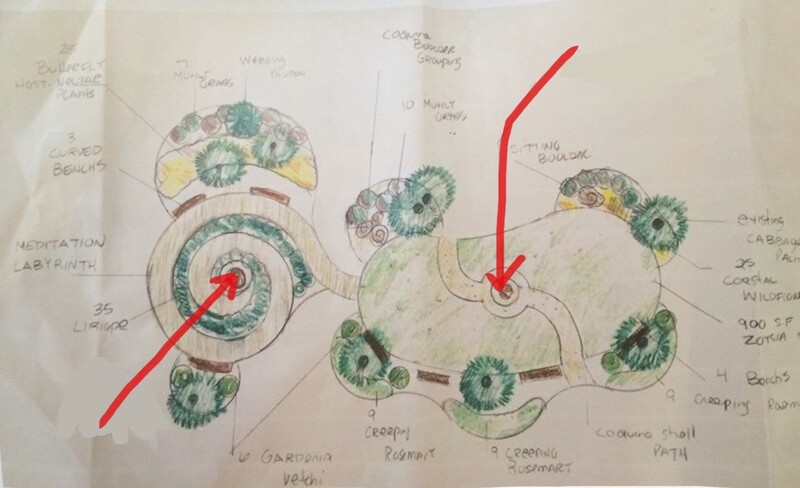 The diagram above illustrates the garden’s preliminary design with the sculpture locations denoted by the arrows. We have contacted the Island Art Association to assist in reaching out to area artists to submit concept drawings/plans for the sculptures. Materials and labor to execute the designs will be primarily solicited from the community through volunteers and donations. This is an opportunity to add to our community’s public art, as well as an opportunity to showcase your talent and creativity. Concept drawings may be submitted by individuals or groups. We will select designs for the sculptures with advice and guidance from the IAA. While it is planned for the park to be dedicated at the end of September, the timeline for construction will be determined once the final designs are selected. If your design is selected, you will then collaborate directly with 8 Flags Playscapes and other volunteers to construct and install the piece. 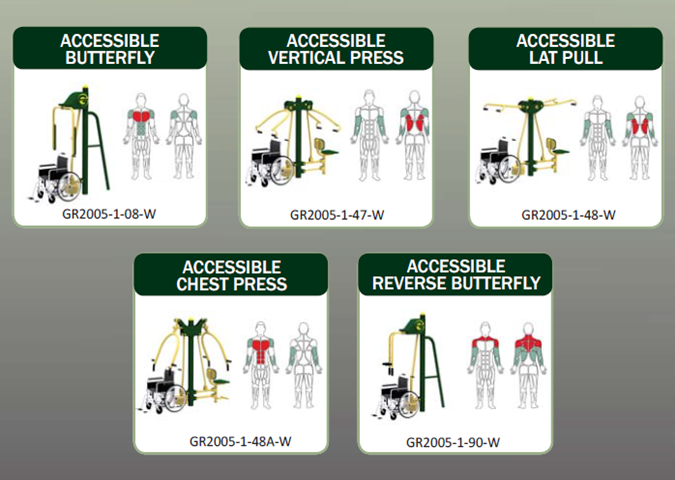 Concept submittals should include, as a minimum: one or more drawings, a brief written description of the construction and materials to be used, as well as feedback as to which components of the proposed design you can execute yourself and which components you would need outside assistance/expertise to execute. The diameter of the space for each sculpture should be within a 3-4′ range; electricity and water are available to these locations. An audible component to the design, such as a fountain, chimes, etc. would be an added benefit, but is not a requirement. The deadline for submittals is September 6, 2016 by 5 pm. Submittals should be dropped off at the Island Art Association Gallery, 18 N.2nd Street, Fernandina Beach FL. All submittals packets, and every page therein, should be clearly marked with your name and contact information (email & telephone). We hope you will get your creative juices going and help us get some art in this park! 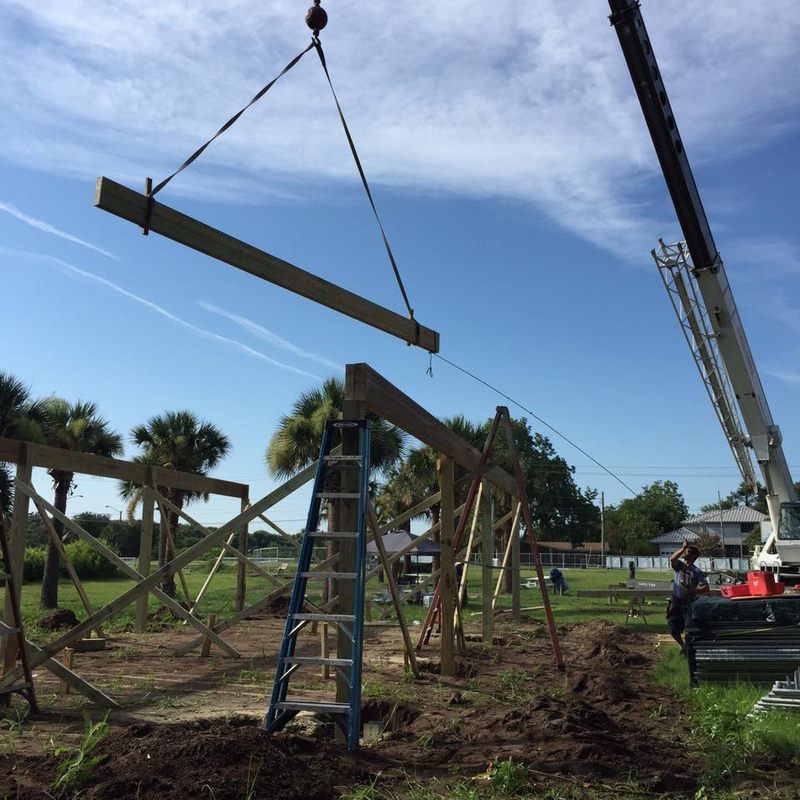 With Parker Contracting at the helm, Coker Crane and Rigging helps place a beam for the large pavilion at the park. Elsewhere on the site, a new restroom facility starts to emerge!